Shakespeare’s happy endings were his romance plays. The storylines moved with comedic and tragic turns, but an uplifting denouement separated those works from others. So what would Shakespeare write about the life of Gus Ganakas? The former Michigan State coach, who passed away last week at age 92, overcame basketball tragic turns that make for a challenging story to tell, but Shakespeare would have written it as a romance. No fiction is needed for a Hollywood ending when living well is the best revenge. “Ganakas” starts as a basketball love story. Then tragedies befall him, creating more heartache than one man should have to suffer in sports. But Ganakas, through his uplifting spirit, trudged on with an unconquerable heart. The good guy characters on his side were Jud Heathcote, Tom Izzo, Earvin “Magic” Johnson – as he was known in his green and white days -- and Greg Kelser. Johnson and Kelser were the All-American stars on Michigan State’s 1979 national championship team. They remained devoted to Ganakas, but they played for his successor, Heathcote, who two decades later handed the program off to his long-time assistant, Izzo, who elevated the Spartans to another level with a 2000 national title and seven Final Fours. Heathcote and Izzo never took for granted the role Ganakas played to lay the foundation to Michigan State basketball from the Magic era forward. He was anything but a third wheel to them. 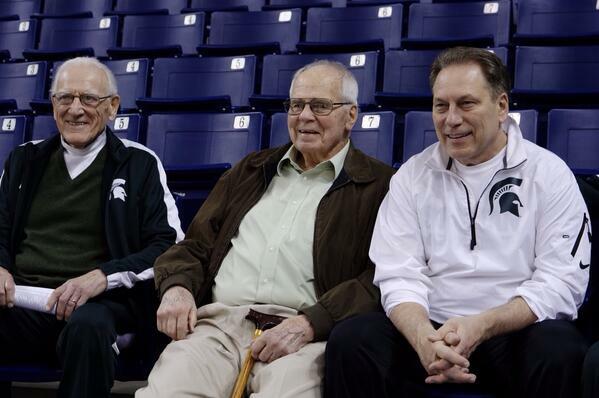 They posed for photos as Michigan State’s only basketball coaches since Ganakas’ first season, 1969-70. “You'll learn all you need to about Gus when you look at the way he handled being replaced as head coach,” Izzo said in a statement last week. “Most of us would have wanted our replacement to fail, hoping it would make us look good. But that wasn't who Gus was. Yes, Heathcote ultimately had to close the deal with Magic on his own, while Izzo’s magic has been painting Michigan State a blue blood invited annually to the Champions Classic with Duke, Kentucky and Kansas. But the first steps of that thousand mile journey began by crossing the Ganakas Bridge. Shakespeare might sharply compare Ganakas to Bobby Knight, the former Indiana coach who remains a bitter 78-year-old man that the school fired 19 years ago. Knight refuses to return to campus and once infamously told Dan Patrick in a radio interview that he hoped “they’re all dead” of the administrators that had him fired. This isn’t revisionist history, painting Ganakas in the best light possible upon death. This is straight from the mouths of the thoroughbreds in the race. Johnson and Kelser have highly praised Heathcote over the years for shaping their careers on a championship team and Izzo for lifting the program higher, but they consider Ganakas special. What finer tribute from Magic than to call Ganakas “my” coach without an asterisk noting he never played for him? Shakespeare could easily work with that. Johnson had grown up in nearby Lansing bleeding green and white while attending Ganakas’ MSU camps, but Ganakas was unceremoniously fired after his seventh season, Magic’s junior year at Lansing Everett. His dismissal could have burned bridges, but Ganakas’ forgiving personality didn’t allow it. Without the magnanimous Ganakas, there likely is no statue of Johnson outside the Breslin Center and there is no 1979 NCAA banner hanging inside. Without the momentum Johnson injected into the program, the Breslin Center, opened in 1989, might not have been built for another decade of wear-and-tear straining outdated Jenison Fieldhouse. Johnson, though, needed help to lift Michigan State basketball to the pinnacle. He received it from Kelser, who had been recruited in Ganakas’ final class, playing his freshman season for him, 1975-76. If you pooh-pooh losing Johnson and Kelser to Michigan State’s basketball history a tragedy, close your eyes and imagine the 1979 NCAA banner hanging at Michigan’s Crisler Arena and a Magic statue outside of it. Shakespeare would painfully haunt Spartans with those nightmare images throughout the play. The primary basketball tragedy that Ganakas suffered was the devastating January 4, 1975 afternoon that 10 African-American Spartans walked out on their coach prior to a home game against No. 2-ranked Indiana. They wanted Thomas McGill, a 6-foot-4 senior black player, to start at forward over Jeff Tropf, a 6-7 white freshman. The sad irony of them walking out was Ganakas, similar to Michigan State’s pioneering Underground Railroad football teams coached by Duffy Daugherty, was ahead of his time. He ignored unwritten limits of black players on a roster. If you doubt that, consider the 1974-75 Indiana team numbered only five black players. It was Indiana’s nucleus that returned a year later to claim the last unbeaten NCAA title in college basketball. Imagine Shakespeare wringing and twisting irony out of that contradiction. The pages would be soaked. The walk-out lasted only one game in what finished as a 17-9 season, but the damage was done. The administration couldn’t let a player revolt determine a coach’s future. It waited one more season to do that. Ganakas was fired after the 1975-76 season despite the possible consequences of losing a generational player growing up in the school’s back yard waiting to play for the Spartans. Ask Clemson fans what it feels like to lose a generational player in its backyard, Zion Williamson, to a rival down the road, Duke. When Magic eventually committed to Michigan State in a press conference at his high school’s auditorium, I was there as a college kid writing for “The State News.” I noticed Magic’s mother, seated at the table on the stage, bowed her head when Magic was asked about Ganakas. I can still picture her looking down at her folded hands, gritting her teeth. She remained hurt a year later. Gus got over it better than anyone. Another act with heartache portrays Ganakas as one of the original one-and-done victims. “One-and-done” players jumping from college to the NBA would not be coined until decades later, but essentially Ralph Simpson’s sophomore season, 1969-70 while averaging 29.0 points and 10.4 rebounds a game, was his the 6-6 guard/forward’s Michigan State career. The previous year, when freshmen were still ineligible for the varsity by NCAA rules, many Michigan State fans came to see Simpson in the freshmen game and departed Jenison before the varsity tipped off. That season was Ganakas’ first as head coach. He had been promoted from assistant shortly before the season following the sudden death of John Bennington. Simpson eased the transition, but only for one year. He jumped to the American Basketball Association. Simpson followed the path of his Detroit Pershing High teammate, Spencer Haywood. A year earlier, the University of Detroit’s forward/center was the first one-and-done sophomore to turn pro. Both ABA signings were seismic shifts to college basketball in the war between the ABA and NBA. Shakespeare, though, would recognize the socio-economic tragedy. In a rich country, a poor black kid from Detroit’s inner-city felt the need to accept money to help his family. The tragedy for Ganakas was what might have been if Simpson had stayed and what might have been if he coached Johnson and Kelser. But Ganakas never let such brushes with the national stage dampen his spirit. He wanted to know how you were doing before you asked how he was doing. I know that because I was fortunate to see him on a few trips back to Michigan State games, a Michigan State game against Stanford in the Bay Area and at NCAA Regional in Atlanta. Not long ago I met with him one last time, along with his son Gary, who played for him. It’s for a project on Brad Van Pelt – one I can finish only if life stops getting in the way. I’ll eventually enjoy quoting him, posthumously, for one last story. Gus Ganakas was one of the classiest men to coach a basketball team. Father Time needed 92 years to defeat his beating heart, but the human scourge of regret never beat the spirit in his heart. Maybe that’s how Shakespeare would have finished the basketball romance.